I am very stunned! Although I have already firmly assumed that the whisky will appeal to me when it comes to the key data. However, I did not expect such an aromatic and wonderfully harmonious revelation. Already the mouth-watering sherry and wine flavors along with the light smoke and the beautiful Brennereicharakter in Nosing let my heart beat faster. The taste explosion on the tongue then closes the bag. I'm in the whisky-heaven! The interplay of sherry or wine with the unmistakable Laddie character can almost always convince me. And so even the flavors that flow towards me when pouring show me that I will not be disappointed. The first nose is characterized by intense chocolate sherry flavors and a wonderfully integrated smoke. This is expected to be much more restrained than in an Octomore or as in most of Port Charlotte, but this offers plenty of room for the distinctive sherry and wine flavors. This results in a very harmonious spectrum of different fruits, with juicy cherries and sweetened blackberries and plums set the tone. Due to this fruitiness, it can be seen that not only a sherry barrel but also a wine barrel was involved. As I like it with whiskys of this distillery, the distilling character is also the foundation of the malt. In this Laddiemore he shows himself through the well-known cheeses and through slightly musty grains. Wow, what a taste explosion! As if I had licked a spoonful of forest berry jam, the fruitiness in my mouth spreads. These are joined by lots of liquid chocolate, mulled wine sweets and red fruit jelly. The smoke is also noticeable here and shows through a blazing campfire in the background. The flavors do not want to abate. So the fruitiness, the chocolate and the subtle smoke continue to spread in the mouth. On the whole, the taste and the finish continue what has already been announced at Nosing. Since you get the desire for more! Laddiemore - Why has nobody ever been on it before? It is the whisky heaven. Terrific. No laddie, no octommore, it's something new. Hats off, Marco. 91 points! Smoke. Ashy, greasy, sweetish, dry. Everything! Charred cherries. Cooling slightly. Some shortcrust pastry. Blackberries. He has steam. Incredibly full. The water runs together in the mouth. Subtle bitterness, dark chocolate. In addition grapefruit. Smoky dessert. Very long. Warm, ashes over fruit. 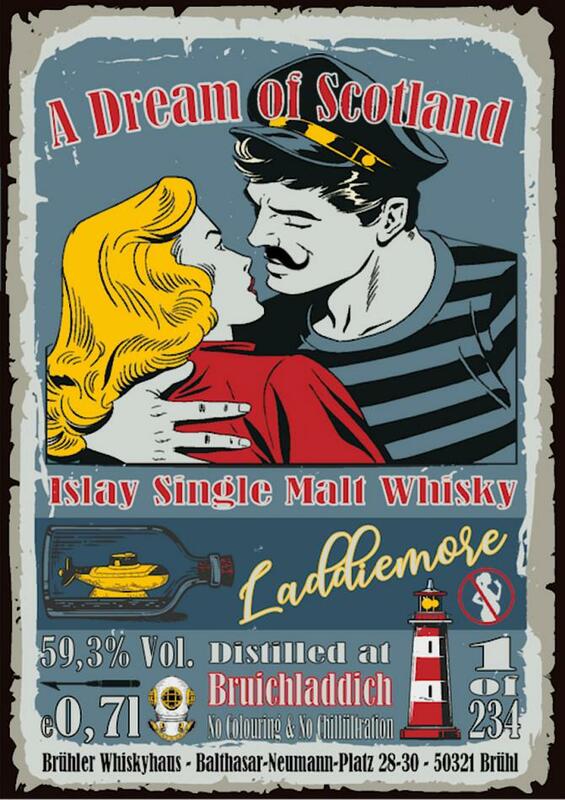 Praised and quickly sold out the Laddiemore. Sample arrived at my place (thanks Carsten for the FT!). A dull smell, dark sherry, some bacon (but not as long as in a 2005 Ledaig). Ok, let's add some water, lure it out of reserve. Lots of sherry is coming, lots of laddie, I find more laddie and dark sherry than octomore-typical notes. Fine part! But the big sensation is missing me to land beyond the 90, but the elegance, balance is not there. This is exceptionally good! 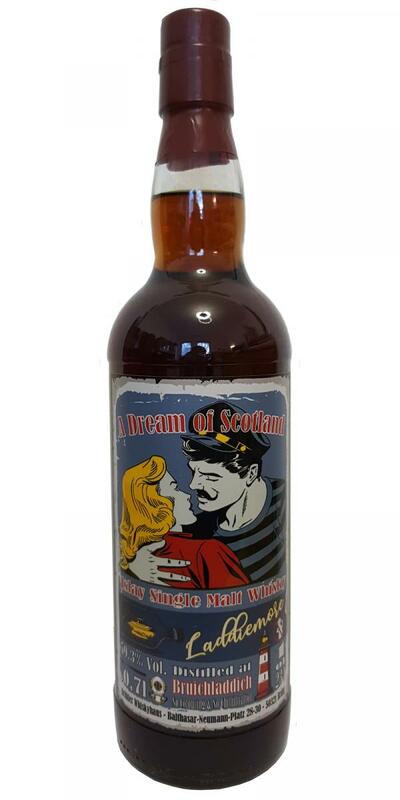 The winey taste is perfectly balanced with the sweetness of the sherry and the gentle smoke from the Octomore. Great nose, unfortunately falls on the palate pretty nice. Still delicious and a cool idea to fill it! Great nose! On the one hand fresh, mineral, impetuous, slightly sulphurous and powerful. On the other side dark, set, extremely sweet and fruity. The smoke is definitely there and not too short, but becomes weaker over time and barely perceptible towards the end. Medium, fermented red fruit, sweet espresso. Wonderfully fruity and sweet. Complex interaction of wine and sherry. Smoked bacon, slightly malty-cheesy Laddienoten, red to dark red fruits appear first, then comes from the background of the wine with grapes, mineral barrel notes, always accompanied by an increasingly ashy becoming smoke. Beautiful sweetness meets the mouth, creamy texture and with some water perfectly integrated alcohol. Cherries, raspberries, some chocolate and wonderfully integrated smoke, accompanied by some pepper and dryness. Intense and tasty. Sweet fruits and peppery smoke and a slight dryness remain, medium to long.